House Removals From UK To Spain - What About Motorcycles? House removals from UK to Spain can take a long time to organise. It is important to remember every single thing that must be taken over to Spain to enable you to enjoy your new life there. But what about larger items such as motorcycles? Can they be taken too? Some people, when they organise removals to Spain, might forget that they also need to arrange for transport for their vehicles. Some may want to drive or ride them to Spain themselves, but this will take a long time, and can be expensive in fuel and insurance. Therefore, it is always worth checking whether the company you have chosen to carry out removals to Spain from UK will be able to also transport your car or even a motorcycle. It is no use simply putting the vehicle into a crate and hoping that it will reach the other side safely as you fly across to meet it. Apart from your home, your vehicle is most likely your most expensive possession, and it needs to be packed and secured safely. It is always a good idea to speak to your removal company before arranging for them to transport your goods from the UK to Spain as they should be able to tailor a solution that you are happy with. When you get a quote from the company, don�t forget to mention that you also need to ship a car or motorcycle as well. Even if their website doesn�t specifically mention it, for example, the removals company may work with trusted partners who will be able to send the vehicles across for you. 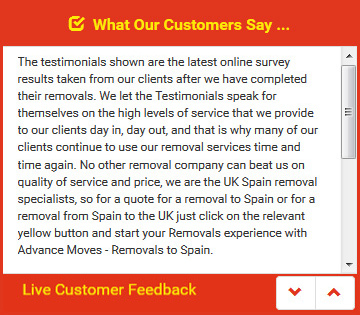 House removals from UK to Spain don�t need to be stressful. When working with the right company, they can be completely painless and easy. At Advance Moves, we pride ourselves on protecting your possessions as though they are our own. See our website at http://www.advancemoves.com/, or call us on 0871 218 0612. Email on info@advancemoves.com.